According to the United States Environmental Protection Agency, 90 percent of our time is spent indoors. Although this may seem like it’s great for our health since outdoor air is filled with car pollution and allergens, the reverse can be true if we don’t take the time to clean our homes. Although indoor air isn’t exposed to as much pollution as outdoor air is, it’s also a contained environment which can be problematic. 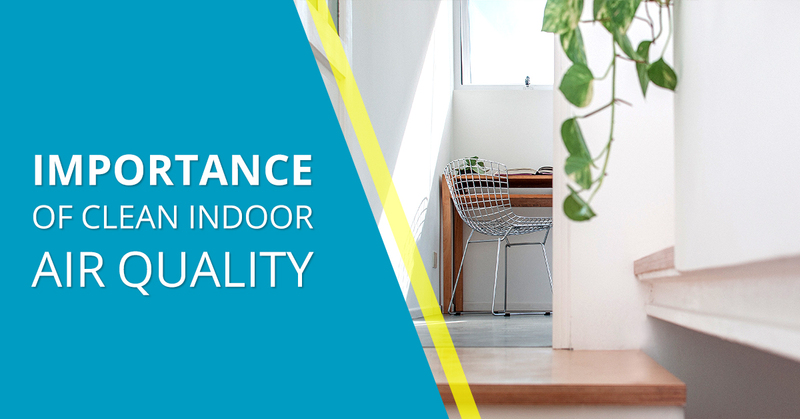 In this blog, we’re going to take a look at the most common causes of poor indoor air quality and what you can do about it. Although mold and mildew require a specific environment in order to grow, they can wreak havoc on your home’s indoor air quality when they do. Mold really only grows in damp, warm environments, usually out of the way of light and in areas where the spores won’t be disturbed as they grow and multiply. Some molds are worse than others and can lead to serious illness. Maintaining proper ventilation in your home will help prevent this. Sometimes the problem isn’t what’s happening inside the open, it’s the fact that people track allergens or germs in from outside. For example, if you step on or get an allergy-causing plant onto your clothes while you’re outside, you may bring them inside your home. When this happens, it’s going to be very difficult to get it out, especially if it’s rubbed into your carpet or a couch. This air within your home is constantly circulating thanks to your HVAC system. But this doesn’t just keep you warm in the winter and cool during the summer, it also plays an important role in removing contaminants from the air in your home and keeping indoor air quality fresh. Your HVAC system has an air filter on it that should be replaced regularly if you want to maximize this effect. Another way to improve circulation is to crack a window or sliding glass door every once in a while. This will allow some fresh air in and allow you to breathe a little bit better. Believe it or not, many common household cleaning products can contain dangerous chemicals that shouldn’t be ingested in any way. When you use these products frequently, your indoor air quality will drop significantly. It’s best to use cleaning products in moderation, and when you do use them, be sure to open a couple of windows before you start. Let’s face it, we could all stand to clean a bit more. If you vacuum and clean your upholstery at least once or twice a week, you shouldn’t have any problems keeping your air quality clean. However, if you only clean once a month or two, you may have some problems. Dust will likely begin to build up a lot in your home and you’re going to be breathing that in. You should also be changing your sheets and having your rugs professionally cleaned. Crown Products offers a variety of cleaning supplies and disposal bags to keep your home air quality clean and free of allergens. If you have a baby, check out our diaper disposal bags and dispenser as well as our facility wipes. If you’re a pet owner, consider purchasing our pet waste disposal bags or our adhesive cleaning roll. Don’t let the above issues keep you from having a clean home that’s healthy to live in; view our cleaning products and you’ll most likely find something to fit your needs. Call us if you have any questions.